Fmr. UN Weapons Inspector Scott Ritter Warns Against “Politically Motivated Hype” on Iran Nuke Program | Democracy Now! former UN weapons inspector in Iraq from 1991-1998. He is author of Iraq Confidential and Target Iran and the forthcoming Dangerous Ground: America’s Failed Arms Control Policy from FDR to Obama. His latest article in the UK Guardian newspaper is Keeping Iran Honest. Monday’s missile tests follow Iran’s disclosure last week of a second uranium enrichment plant. On Friday morning, President Obama, along with British Prime Minister Gordon Brown and French President Nicolas Sarkozy, accused Iran of building a secret nuclear fuel plant. PRESIDENT BARACK OBAMA: Good morning. We are here to announce that yesterday in Vienna, the United States, the United Kingdom and France presented detailed evidence to the IAEA demonstrating that the Islamic Republic of Iran has been building a covert uranium enrichment facility near Qom for several years. SHARIF ABDEL KOUDDOUS: French President Sarkozy warned that Europe and the United States would tighten sanctions against Iran unless it halted its nuclear program. PRESIDENT NICOLAS SARKOZY: [translated] Everything must be put on the table now. We cannot let the Iranian leaders gain time while the motors are running. If, by December, there is not an in-depth change by the Iranian leaders, sanctions will have to be taken. SHARIF ABDEL KOUDDOUS: Iran, however, refuted Western fears and said its nuclear activities are purely peaceful. This is Iranian delegate Mansour Salsabili addressing the UN General Assembly Saturday. MANSOUR SALSABILI: The delegation of the Islamic Republic of Iran would like to put on record that these allegations, fears and concerns are totally untrue and without any foundations. Iran’s nuclear activities are, and always have been, for peaceful purposes and therefore pose no threat, pose no threat whatsoever. The IAEA reports bear witness to the peaceful nature of Iran’s nuclear activities. SHARIF ABDEL KOUDDOUS: Well, my next guest was a former UN weapons inspector in Iraq in the 1990s. Scott Ritter is the author of Iraq Confidential and Target Iran. His forthcoming book is called Dangerous Ground: America’s Failed Arms Control Policy from FDR to Obama. His latest article appears in The Guardian newspaper in London; it’s titled “Keeping Iran Honest,” where he warns against, quote, “politically motivated hype.” Scott Ritter joins us right now from Albany, New York. Welcome to Democracy Now!, Scott. SCOTT RITTER: Thank you very much. SHARIF ABDEL KOUDDOUS: Begin by explaining why do you call it “politically motivated hype”? SCOTT RITTER: Well, I think the answer is quite obvious. Look, on Thursday, this coming Thursday, the United States, Great Britain, France, Germany, Russia, China are going to sit down with Iran, ostensibly to discuss, you know, how to break through this impasse that exists between the Western countries and Iran concerning its nuclear program. But the Obama administration has come to a, you know, preordained conclusion that there’s nothing that can be done about Iran’s nuclear program, that Iran either has to get rid of it all, or there’s nothing to discuss about. That’s not much of a — much of a discussion. Iran is a signatory to the Nuclear Non-Proliferation Treaty. It has a complete inspection regime conducted by the International Atomic Energy Agency. It’s not been found to be in noncompliance. And yet, here we are condemning Iran for doing its job, declaring a facility, inviting inspectors in. And the conclusion it’s reached from this? That they’re producing nuclear weapons. This is politically motivated hype designed to create a situation this coming Thursday that will find the United States unable to reach any sort of agreement with Iran about its nuclear program. SHARIF ABDEL KOUDDOUS: In his comments, President Obama said, “Iran is breaking the rules that all nations must follow.” You write that he’s technically and legally wrong. Why? SCOTT RITTER: Well, again, Iran is bound by its agreements with the International Atomic Energy Agency. These agreements are between Iran and the IAEA. You cannot compare Iran’s arrangement with the IAEA with any other nation, so it’s an absurd argument to begin with. Second of all, Iran’s agreements with the IAEA are — you know, the current agreements go back to 2003 period, where Iran, in exchange for Europe and the United States recognizing the legitimacy of Iran’s nuclear aspirations — that means to enrich uranium for peaceful energy uses — Iran would voluntarily agree to what’s called the additional protocol of inspections, as well as what’s known as the Subsidiary Agreement. The Subsidiary Agreement requires Iran to declare any facility at the time that it intends to produce it, create it, to build it, as opposed to the old agreement, which said Iran must declare this facility 180 days prior to the insertion of nuclear material. Iran said, “We will abide by this additional protocol of inspections and the Subsidiary Agreement on a voluntary basis, until which time the Parliament of Iran ratifies these new agreements.” These have never been ratified, so this was a voluntary submission on the part of Iran. 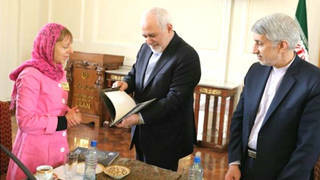 In 2007, Iran withdrew from this voluntary arrangement, citing the noncompliance of its partners — Europe, the United States — in recognizing the legitimacy of Iran’s nuclear program. Iran’s not in violation of anything. Iran is in compliance, and the IAEA has stated this. The IAEA has said that the fact that Iran was in compliance with the old Code 3.1, the Subsidiary Agreement, the old Safeguards Agreements, means that you can’t find them to be in noncompliance with this new set of arrangements. The key here isn’t the technicality of the legal documents; it’s about the diversion of nuclear material. And the IAEA has a 100 percent accounting for the totality of Iran’s nuclear material. So, even if Iran produces this new facility, which, by the way, is not in operation and won’t be in operation for over a year, no nuclear material has been diverted, there still is a full material balance, and the IAEA is in complete control of the situation. Iran is not in violation. This is not a reason to panic. This is much ado about nothing. But again, we come back to the original premise: this is about political hype, the United States hyping up a capability in Iran which doesn’t exist, and that is the capability to produce nuclear weapons. SHARIF ABDEL KOUDDOUS: And the issue of Israel reserving the right to launch a preemptive military strike against nuclear facilities in Iran, how does that play into the upcoming talks and how Iran is reacting right now? SCOTT RITTER: Well, it’s not just the issue of Israel reserving the right, the issue of the United States reserving the right. Remember, President Obama said that the military option is not off the table. Now, if you’re the Iranians and you make a decision that you strategically require an additional source of energy, such as nuclear energy, to supplement your domestic energy usage so that you free up your oil production and gas production for exportation, so you can earn money, this is a big deal. This isn’t insignificant. And so, you’re building this capability. Israel and the United States say they want to bomb it. What do you do? Well, the first thing you do is you build redundancy, and that’s what this new Qom facility represents. It’s redundancy. It’s a backup to the Natanz primary facility. Again, it’s been declared, no nuclear material has been diverted. But it’s there as a backup. The second thing you do is you fire off missiles in a warning that you have an inherent right and capability of self-defense. Israel launched a massive air exercise last year, in which it demonstrated the ability to fly hundreds of aircraft, you know, the distance necessary to strike targets in Iran. The United States is carrying out exercises with Israel as we speak. You know, the bottom line is it’s the United States and Israel which are the more aggressive of the players here. Iran is not an aggressor. Iran has not attacked anybody. Iran is simply trying to do that which it is legally allowed to do: produce enriched uranium for the purposes of nuclear power. It’s Israel, which, by the way, is not a signatory to the Nuclear Non-Proliferation Treaty, claims it will never be a signatory and has a massive nuclear weapons capability — it’s Israel and the United States which are creating a crisis out of nothing. SHARIF ABDEL KOUDDOUS: And what would you like to see happen right now, in terms of the talks coming up on Thursday? This is the first direct talks between the US and Iran in more than thirty years. What would you like to see happen? And what ultimately can come out of this? SCOTT RITTER: Well, I’d like to see diplomacy succeed. The bottom line is, the more the United States and Iran talk with one another, the less likely it is that the two will engage in hostile actions against one another. But you can’t have diplomacy if it’s a one-way street. If the talks open up with the United States providing a whole list of demands that Iran must accede to or else the talks will fail, then the talks are doomed to fail. The United States — you know, here we have a president who says he wants to get rid of nuclear weapons in the world today, and he recognizes that a key aspect of this is a viable, valid nuclear nonproliferation treaty. But for a treaty to be viable and valid, it must be applicable to all powers. That means that when Iran signs the treaty, Iran must not only abide by the treaty, but also to be able to operate fully within the context of the treaty. And Article IV of this treaty clearly allows Iran to have the right to enrich uranium for the use — for use in nuclear power. The United States, in citing the law, must be willing to abide by the law, not only in terms of its own actions, but also to allow Iran full obligations and rights under the law. If this isn’t what’s going to happen, then these talks are doomed to fail. I want these talks to succeed. And I’m hopeful that the Obama administration right now is carrying out pre-game posturing but, once it comes time to sit down at the table, will actually let the tools of diplomacy work, which means it has to be a two-way street. SHARIF ABDEL KOUDDOUS: And Iran fired these two long-range missiles on Monday. Why do you think that it did that just days before these talks? It’s a sensitive situation. Again, this is an argument or discussion we shouldn’t be having. If the Obama administration was responsible here, they’d de-emphasize this hype, this politically motivated hype, and deal with the reality that there is no nuclear weapons program in Iran, that the newly declared Qom facility is not a threat to international peace and security, and that when Iran and the United States sits down this coming Thursday, that we will — you know, the United States hopes to find a way out of this morass, that we hope to find a way to peacefully coexist with Iran, an Iran that has a nuclear energy program fully monitored by the International Atomic Energy Agency. Unfortunately, that’s not the premise going forward, and then you get both sides behaving in a precipitous and irresponsible manner. The Iranian missile launch is precipitous, it’s irresponsible, but it’s in keeping with the trend that all parties are participating in. SHARIF ABDEL KOUDDOUS: Scott Ritter, I want to thank you very much for being with us. Scott Ritter was a UN weapons inspector in Iraq from 1991 to 1998. He’s the author of several books, Iraq Confidential, Target Iran. His forthcoming book is called Dangerous Ground: America’s Failed Arms Control Policy from FDR to Obama.